Confessions of a Teaching Junkie: It's a Mid Winter Mad Money Giveaway! 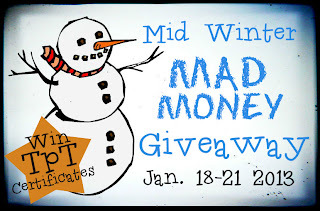 Mid Winter Mad Money Giveaway! Up for grabs are not one, but TWO $75 gift certificates for TPT! I know that I could do some serious damage with $75 on TPT. All you have to do is use the Rafflecopter widget below to enter. If the widget won't work for you, please email me at: thetutorhouse@hotmail.com and let me know you would like to enter. WOW!! What an amazing giveaway! To date, I have 64 items on my wish list! haha! They are mostly math and ELA resources for 4th grade and some clip art:) Thank you so much for the opportunity! I have over 80 items on my wishlist that I have been waiting for a sale to buy. This would really take care of some literacy and math centers I want. I also am addicted to clip art so I would buy some of that too. Thanks for sponsoring this contest. What a nice giveaway. I would be able to get all my things in my wishlist. I think there might be 94 things in there. Thank you for the chance. Best wishes to everyone. Just stopping by and saw this awesome give away! I would love to purchase some guided reading activities or novel units for my 4th grade class if I won. Oh my goodness, where would I start....I would love to spice up my reading and math centers! Thank you! I'm your newest follower! Love your blog! Good luck with the G. Certainly, those blogs are awesome. I know some of them and they rock! Wow! If I won, I'd have some tough choices. I have over 50 items on my wishlist. I couldn't cover them all, but could make a dent in the list! Thanks for the opportunity! Wow! I have 191 items on my wishlist and 7 in my cart right now, so this would be a great one to win! Thanks ! I have so many items I want, especially new clip art!